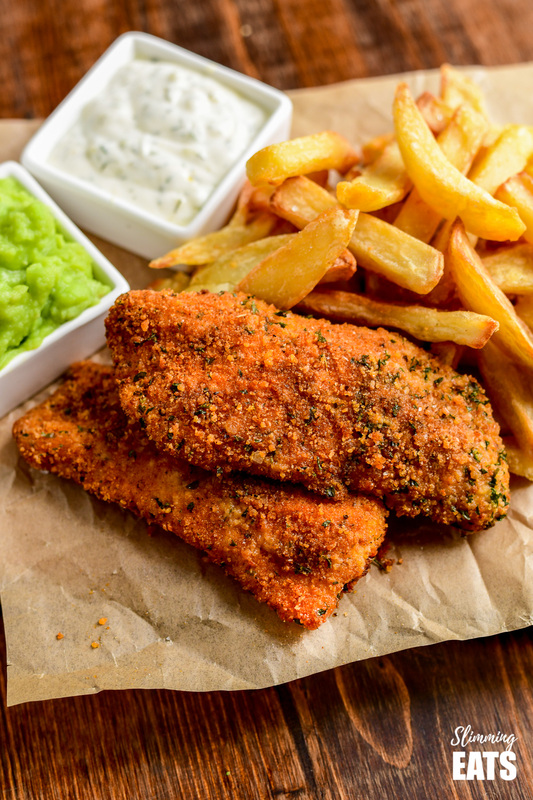 Tefal Actifry Fish and Chips – a healthier take on this classic British takeaway dish complete with tartare sauce. 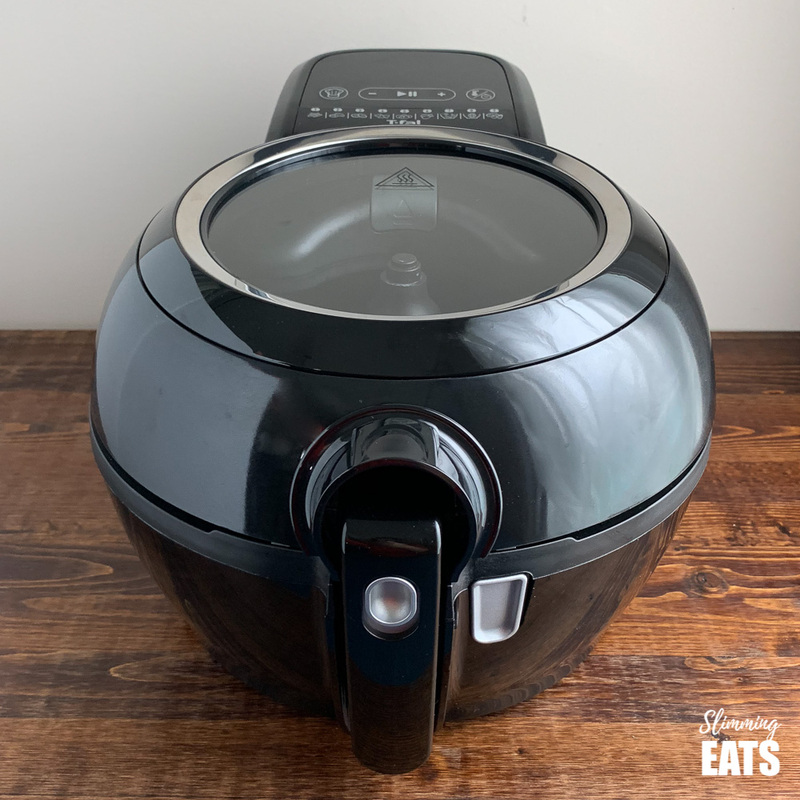 It’s no secret that I’ve long been a fan of the Actifry, originally starting with the first model and now with an upgrade to the amazing Tefal Actifry Genius model. 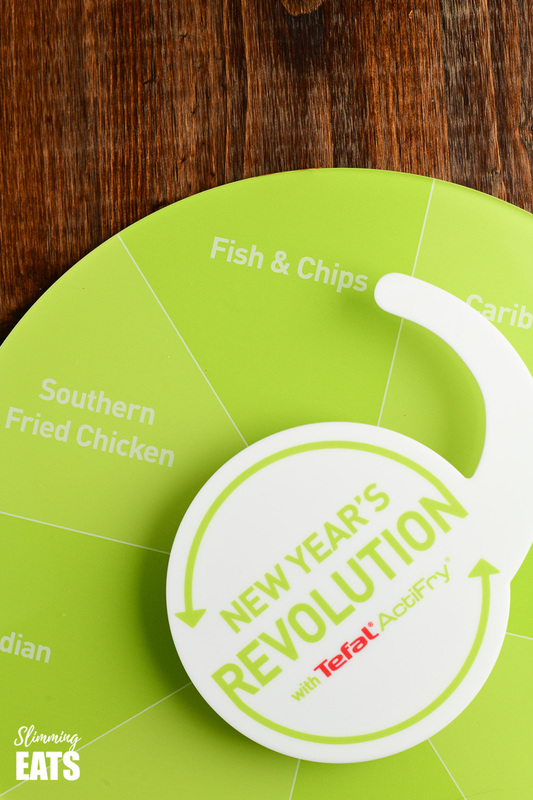 So when Tefal asked if I would participate in this New Year Revolution Challenge of course I accepted. What’s different about the Genius? Previous Actifry models really only had a simple timer mode. Now Tefal has taken this to the next level by adding modes to the Genius. There are 9 modes each designed for a specific food type and also a manual mode. Each mode is tailored for the type of food that is cooking and the Actifry adjusts the temperature, stirring and time accordingly. As part of the challenge, Tefal sent me a chopping board, apron and a spinning board for decided exactly what dish I would be creating and as you can see, I scored Tefal Actifry Fish and Chips. My kids have been loving this spinning board and will often ask if they can spin the board to decide what we are having for dinner. 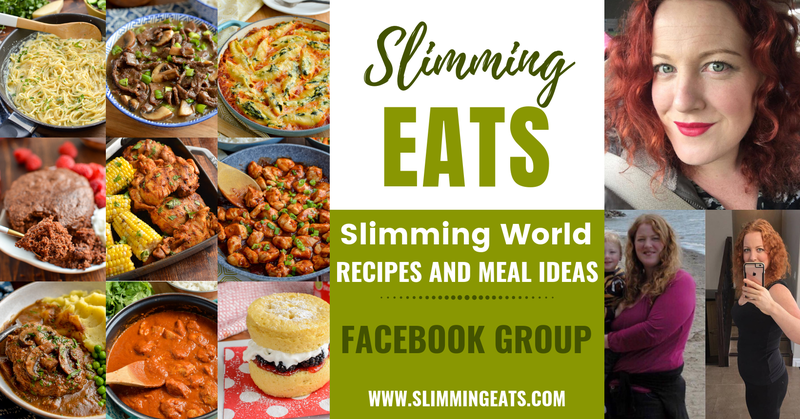 It has been a great way to encourage healthier eating for the whole family, as we cook it all at home and know exactly what ingredients go into everything. They have also been keen to try different cuisines, which they might not have chosen before. 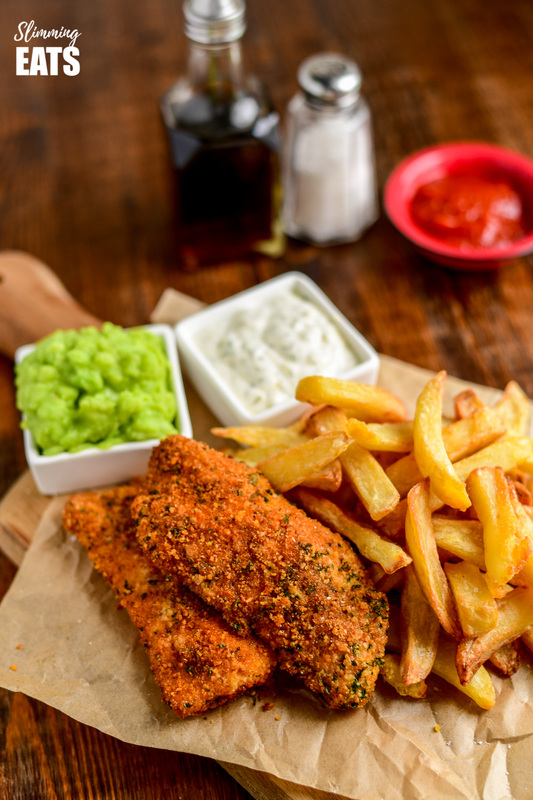 When coming up with a healthier Tefal Actifry Fish and Chips recipe, I wanted to make sure it was family friendly, while also keeping it low in syns and calories. 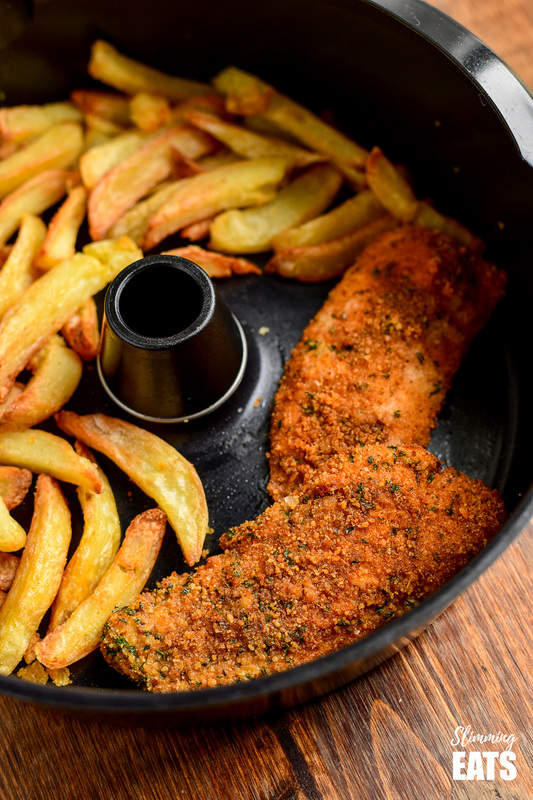 The chips part to this Tefal Actifry Fish and Chips recipe was pretty simple. As the Tefal Actifry effortlessly makes amazing golden crispy chips every time, using my yummy method for cooking them. So that only left the fish part and I decided to go for a deliciously seasoned breadcrumb coating. The fish was amazing, light and flavoursome, with that lovely golden breadcrumbs on the outside, without being greasy. How can I add a 1/3 speed foods to this Tefal Actifry Fish and Chips? 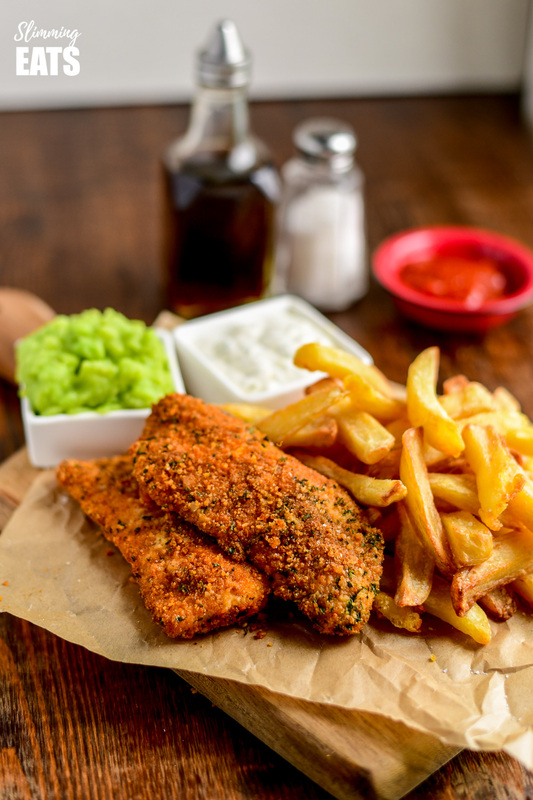 Personally for me, fish and chips just have to come with mushy peas, so for this dish, I allowed myself to not worry about the speed foods. 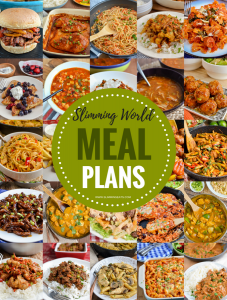 It’s only one meal and so long as the majority of your meals are well balanced with speed foods, the odd one without is going to be fine. But if you do want to add in some speed foods, a big mixed salad would pair perfectly alongside this, especially with my low syn tartare sauce that’s part of the recipe – yum!!! 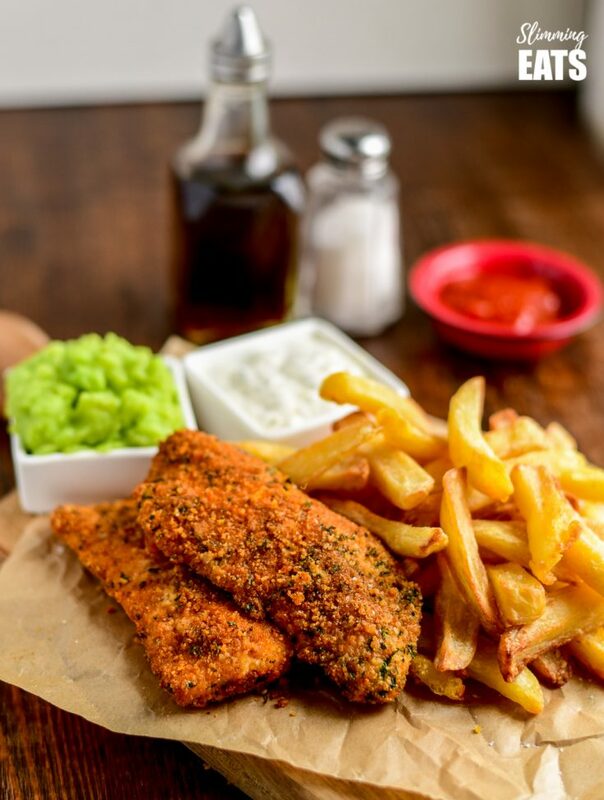 Tefal Actifry Fish and Chips - a healthier take on this classic British takeaway dish complete with tartare sauce. Add all the ingredient for the tartare sauce to a small bowl and mix to combine. Set aside. Add the potatoes to a bowl and cover with cold water. Allow to soak for at least an hour. While the chips are cooking for the remains 20 minutes. Whisk an egg and add to a shallow dish. Spread out on a plate. Pat the fish dry with a clean tea towel of kitchen paper. Once the chips are done, transfer to a plate. Remove the pan from the Actifry, and take out the paddle. Carefully place the fish into the Actifry, well spaced apart. Set for 10 minutes, carefully flip over the fish half way through. Cook for about 1-2 minutes just to make sure it is all heated through. Serve with the tartare sauce. Are the breadcrumbs made from fresh bread, or from a packet? Thanks The recipe sounds so simple to do, I really have to try this. 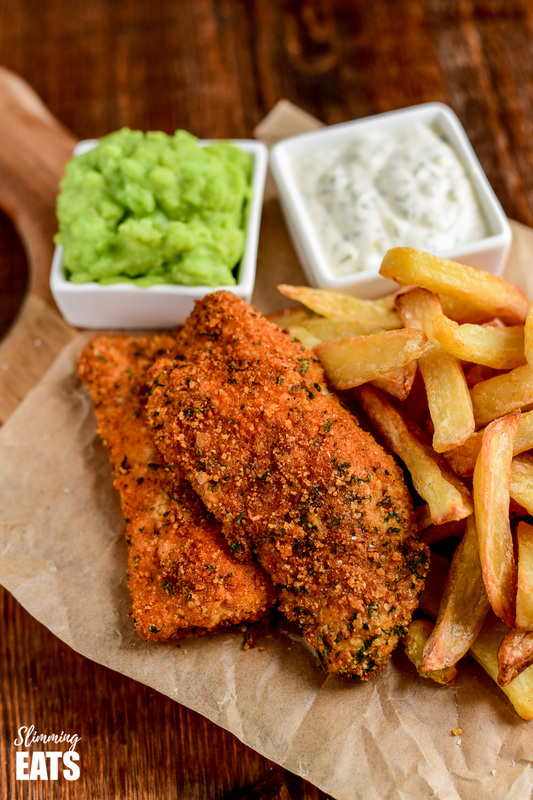 I looove fish n chips. My Actifry has a tray so I can cook the fish ten minutes before the end of the cooking time for the chips and then it is all ready at the same time. They are fine breadcrumbs in a tub. But you can totally make your own if you prefer.